his is a game. Democracy isn't. 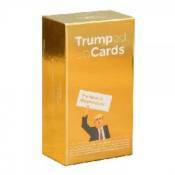 550 total cards: 420 white answer cards 90 blue question cards 40 Trump Cards, which give players special and often unfair advantages to alter gameplay in fun, surprising, and dramatic ways Dimensions: 7 3/8" x 4" x 2 3/4" 2.35 lbs.